The Updated Fourth Edition of the Award-Winning Book that Offers Beginning Educators Everything They Need in Order to Survive and Thrive! Designed for new educators, this award-winning book covers the basic strategies, activities, and tools teachers need to know in order to succeed in the classroom. 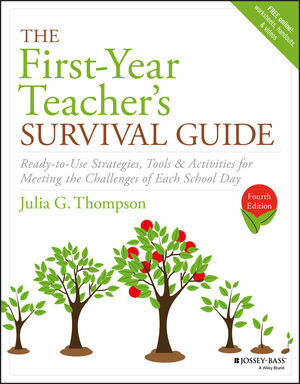 Now it its fourth edition, The First-Year Teacher's Survival Guide contains new and updated material on essential topics including: classroom management (how to prevent or minimize disruptions), sustaining professional growth, differentiated instruction, nurturing a growth mindset, and much more. This must-have guide is filled with the information and tips new teachers need in order to face classroom situations with confidence. Julia G. Thompson served as a classroom teacher for forty years; she currently works as a consultant and teacher trainer. Through her blog (juliagthompson.blogspot.com) and Twitter handle (@TeacherAdvice) she offers tips for teachers on a wide variety of topics. She can also be reached through her website (www.juliagthompson.com).